We’re in a strange between-time in my part of the world: it’s warm enough that spring food is on my mind, but not warm enough for any that food to be actually growing yet. So my compromise position is grain- or legume-based salads, which seem lighter than my usual winter fare but rely more heavily on pantry staples than summer salads need to. This is one of my absolute favorites in that genre, inspired by a fabulous dish I had at La Provence. It’s both simple and tasty and keeps, dressing and all, for several days in the fridge. Proportions are not crucial here: you can adjust the quantities of cheese or tomatoes depending on what you have. Your local tomato options are probably pretty limited right now if you live in a cold part of the world; you can look for hothouse tomatoes from closer to home or try cherry tomatoes, which don’t suffer as much from being out of season. Bring a medium saucepan full of water to boil. Add the lentils, cover, and lower to a simmer. Cook for 20-30 minutes, until tender, then drain in a colander. Meanwhile, make the dressing by mixing the oil, vinegar, mustard, and salt and pepper. I usually do this in a Mason jar so I can shake it to mix, but you can also do it with a fork or whisk in a bowl. Rinse and halve the cherry tomatoes. If you’re like me, you can also squeeze out the seeds, or you can leave them if you’re less picky. Put them in a large bowl. Dice the feta and add it. 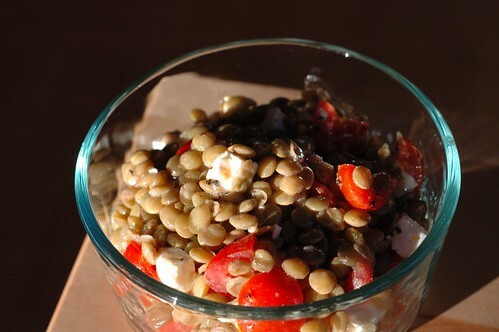 Add the cooked lentils and mix, then dress to taste with the vinaigrette. *Don’t use red lentils here, which break down and lose their shape. Green and brown lentils (which are really more like “brown and browner”) both work fine, as do black and French green lentils, which are a bit firmer in texture and also harder to find.